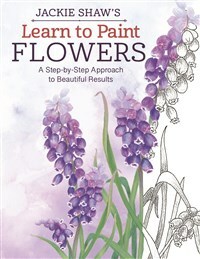 Learn the craft of decorative painting with 19 featured flowers presented in meticulous detail, including full-size, ready-to-use shaded patterns. Jackie Shaw is an internationally recognized decorative artist, teacher, and author, who has written over 200 magazine articles and 30 books. Among numerous other awards, she is the recipient of the Silver Palette, the highest honor bestowed by the Society of Decorative Painters. Her most popular book, The Big Book of Decorative Painting, was widely considered the “bible” on decorative painting, highly regarded for its quality and thoroughness.